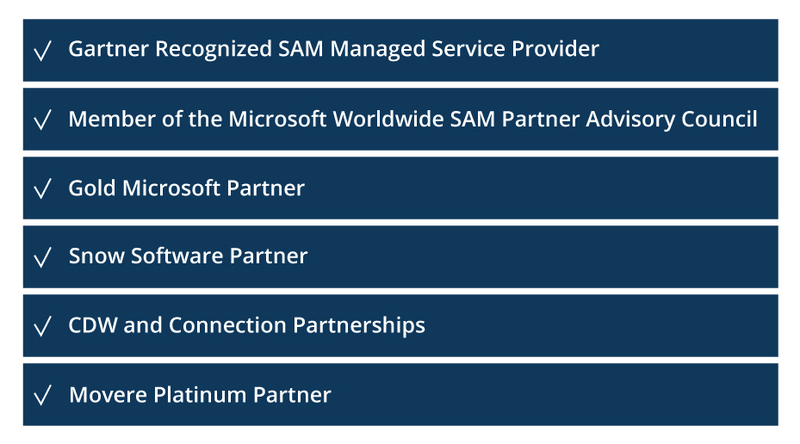 Inviso is an established world leader in Microsoft-centric Software Asset Management (SAM) delivery. Thousands of enterprises have relied on Inviso's data-driven insights to optimize software spend, manage software licensing, plan cloud migrations, and identify security risks. We are a boutique consulting firm providing services customized to your business needs. Our subject matter experts rapidly deliver high-quality outcomes, emphasizing collaboration and agility. Through data-driven analysis, we build clear views of complex environments, identifying areas to optimize and evolve infrastructure and processes, and can pair detailed reviews of software licensing with strategic go-forward recommendations. These analyses provide clear, actionable insights, grounded in data, and focused on your business objectives. We provide SAM Consulting (ongoing Managed Services or Point-in-time Engagements) as well as SAM Tools, with services performed remotely or onsite on your schedule, providing maximum value with minimum impact. Let our consultants assist with managing ongoing license compliance and optimization, provide recurring EA True Up and Renewal assistance, drive infrastructure optimization and modernization initiatives, and deliver on-demand consulting and training. Every organization should maximize the return on software investments whether it is on-premises, in the cloud, or in a hybrid cloud environment. We can help with your current IT initiatives with a SAM Engagement. Our Microsoft Licensing knowledge will help you better understand your environment and licensing needs for the new modern workplace. SAM engagements support internal license reviews, Microsoft Entitlement Analyses, M&A events, EA True Up and Renewal for multiple publishers. Identify the right solution or tools to meet business requirements for your asset management. Our best in class consultants can help with deployment and support of all our tools and solutions. Inviso is a key ingredient in the success of our SAM operation. When Inviso is on the case, we know it’s going to get done right and on time. The data they provide is always top quality, and we rely on that data to help our clients save money and achieve their goals. We’ve relied on Inviso for years because they are professional and treat every job like it’s their most important job. We would not be where we are today without Inviso! They have an excellent knowledge base of the Microsoft products, and their licensing structures. They were able to answer all of our questions regarding licensing, and made the entire process painless and worthwhile. We went into the process worried about the amount of time it would take, but we hardly had to do any work at all. Inviso took care of it all, and was a real pleasure to work with. Bringing together 20+ years of expertise in Software Asset Management and IT tooling, we work to deliver tools and consulting services to help organizations effectively assess and manage their software assets. Along with our highly trained consultants, we can help you navigate Microsoft® SAM Procedures and optimize your IT Environment. * Note that Gartner does not endorse any vendor, product or service depicted in its research publications, and does not advise technology users to select only those vendors with the highest ratings or other designation. Gartner research publications consist of the opinions of Gartner’s research organization and should not be construed as statements of fact. Gartner disclaims all warranties, expressed or implied, with respect to this research, including any warranties of merchantability or fitness for a particular purpose.